Instant Replay Review upheld HP Umpire Gabe Morales' HBP call in the bottom of the 9th inning of the Cubs-Cardinals game. 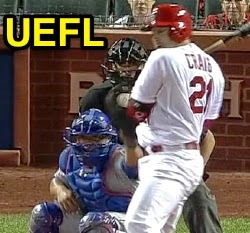 With none out and one on, Cardinals batter Allen Craig took a 0-1 sinker from Cubs pitcher Jose Veras inside and around the area of the upper left arm for a hit by pitch. Upon Instant Replay Review as the result of a challenge by Cubs Manager Rick Renteria, Morales' ruling that the pitched ball made contact with Craig was affirmed, the call was correct. At the time of the review, the Cubs were leading, 3-1. The Cubs ultimately won the contest, 6-3, in 11 innings. This is Gabe Morales (47)'s third Instant Replay Review of 2014. Gabe Morales is now 2/3 (.667 Affirmation Rate) in Replay Reviews in 2014. Crew Chief Jerry Layne's crew is now 6/8 (.750 Affirmation Rate) in Replay Reviews in 2014. Cubs Manager Rick Renteria is now 2/6 (.333 Success) in Instant Replay Reviews during 2014. Umpires are now 49/71 (.690 Affirmation Rate) in Instant Replay Reviews during the 2014 MLB season. CCS, I was watching game 1 and 2 of Redsox vs yankees series and saw that for game 3 Brian Gorman is in for Balkin bob Davidson and James Hoye is replaced by Ron Kulpa, so its HP: John Tumpane, 1: Brian O'nora, 2: Ron Kulpa, 3: Brian Gorman instead of John Tumpane Brian onora Bob Davidson, James Hoye. The only thing i can think of is they tell hoye and davison to now be the two umpires to be in the replay center in NY? like what Vanover and Kellogg did in week 1? Unless they are both sick why would you get rid of them in the middle of a series. Maybe MLb.com is wrong? Plus alot younger umps with less experience in cin vs TB what happend to Tim Welke and Jim Reynolds, I guess Dan Bellino is CC? Many umpires are attending the funeral of a John Hirschbeck's son Michael. A lot of adjustments for this Saturday. Yes. Lot's of MLB guys out to be there for John on this day.